Don't confuse this with a ride on a Bermuda railways train which doesn't even exist. This is a trolley car ride, that looks like a train having wheels and runs on road. It gives an opportunity to experience the era of British empire in an old fashion way. If you want to know why there is no Railways in Bermuda today and what happened to it, check out Bermuda Railway Trail. Separate train tours operate in different parts of Bermuda. The St George's train tour is operated by the company Olde Towne Railway, a business established by the Minors family of Bermuda. It's in operation since 2005. 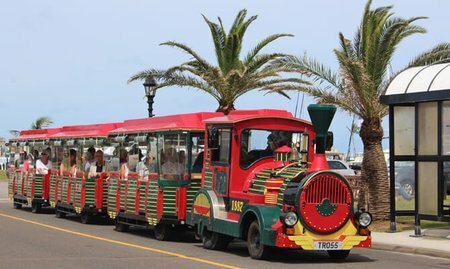 The Train trolley rides in Dockyard and Hamilton are operated by the Bermuda Train Company. The tours are usually of about 60 minutes duration and provide narratives of historical facts of various places that you pass by. The tours are usually available from April through November. The train accommodates about 40 passengers. As you come out of the ferry terminal in St George and walk towards the town center Kings Square, you will see signs for "Train Tickets". The ride takes you along the narrow streets of the historic town of St George, then takes the uphill road past the famous Fort St Catherine, goes past the beautiful Tobacco Bay Beach, and then comes downhill passing the Unfinished Church. 1) St Peter's Church: The oldest Anglican church in the western hemisphere. 2) Town Hall: Built in 1782, this is where the mayor and the town council meet to discuss and take administrative decisions. 3) Old State House: This is the oldest stone building in the island built in 1620. This is where the cabinet sessions were held until 1815 after which the capital of Bermuda was shifted to Hamilton. 4) Somer's Garden: This garden with flowers and trees is named after Admiral Sir George Somers who initiated the first settlement in Bermuda. You can board the train near the sculpture of Sir George Somers. The ride is for about 60 minutes. There is audio narration all through (by the conductor) and you will learn a lot about Bermuda's history, fortifications in St George and the British settlement in the island. At the end of the tour, you will get to understand why St George has been accorded the status of 'World Heritage Site' by UNESCO. Hours: The train trolley tour in St George operates from Monday through Thursday. You can also book the trolley for private parties and occasions. Update July 2013: The ticket counter location has changed and you can now pickup tickets at Kings Square, St George. 1) Pass by the Maritime Museum (now the National Museum of Bermuda) and also the Clock Tower Mall that has an array of boutique shops. 2) Lagoon Park in Sandys: A home to yellow-crowned night herons that roost in the mangroves. 3) The Royal Naval Cemetery and Yellow Fever Burial Ground. 4) The Clock Tower Building: It was built in 1875 and initially contained the naval store offices. Today it's a shopping mall with a wide range of boutique stores. As you sit back and relax, there is a running audio commentary that tells you about the old Royal Naval Hospital and how it dealt with the yellow fever epidemic, how the Royal Navy purchased the dockyard in 1809, and about the island's largest fort The Keep which is located in the dockyard complex. There is also a 20-minute free loop offered in a train trolley within the dockyard that starts from the Kings wharf cruise terminal and comes back. You can hop-on and hop-off at several points within the dockyard complex. This train is operated by the Dockyard management and not this company. 1) Perot's Post Office: This is where the first Post Master General of Bermuda worked who often hand delivered the mails himself. 2) National Library: The library has collection of rare books among many others as well as rich collection of audio & video. 3) City Hall & Art Center: It houses City Hall Theatre, Corporation of Bermuda, National Gallery, and also Society of Arts. 4) Cathedral of the most Holy Trinity: The Church that has been built on Gothic architecture. 5) Supreme Court: Highest court of law in the island. 6) Botanical Gardens: Look out for the beautiful flowers, banana patches, the rubber tree and Bermuda’s own cedars and palmetto. The train briefly stops at the Camden House (Premier's official residence). There is a running audio commentary given during the tour. As you pass by various landmarks and attractions, you will learn many things including about Fort Hamilton and its panoramic views, the way Bermudians catch and preserve water, build their roofs and why they paint them white. Tickets (indicative): $24 per adult ($39 including pass to BUEI), $15 for children ($23 including pass to BUEI), children under 6 are free. Hours: The train trolley tour in Hamilton operates from Monday through Friday. Bermuda Train Company also offers the mini train for special events like weddings, anniversary, parties and other occasions. So you can make a private booking and transport all your guests in a novel and enjoyable way through the scenic routes of Bermuda. We took this tour on Monday, July 31 and we found the tour driver Charlie and the spokesman Marian to be very cross and irritable to all the riders... they obviously have been at this too long... their narration was stale and Marian's voice was very whiney and annoying... they fussed so much about a handicapped customer and could not or would not accommodate the wheelchair for them, so they got off. They also told people that they would be back at the BUIE in an hour for the 2nd part of the tour... they came back at 45 minutes and rushed everyone out... this is definitely not for kids... BORING and not entertaining for them..Get rid of these elderly folks and freshen up what could be a great time. This September I arrived at the Royal Dockyard while on a NCL cruise on the "DAWN". A new trolley tour took us on an hour tour of Ireland Island and Somerset Village. This $15 tour was most enjoyable and was not as expensive as the tours offered by NCL. The train driver "Bud" was also the owner and went out of his way to see that all our questions were answered. I would rate this as a 5 star trip. Hi Erika, The train trolley tour still operates in Dockyard and St George. I need to check for Hamilton though. The St. George's tour is by far the best of the three. No need to buy tickets in advance. There is a ticket counter close to the Ferry Dock at St George. The one hour ride showing the historic town, fort and beaches costs $25 per person. 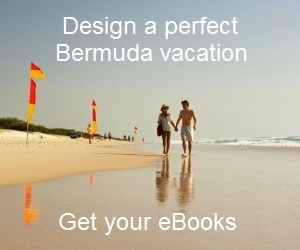 I have seen Bermuda Train Company's website and the booking form. It does look a bit suspicious. As I said, no need to book in advance. The train is running in both Hamilton and Dockyard. This season the Dockyard train is now booked through the ship. We can offer tours separately however the timing and availability varies. We don’t know how many tours are booked until the night before the ship arrives in port. The rate $55 and $26.50 for children 12 and under. The Hamilton Train is available for booking as we have not contracted with a ship this season. The 1 ½ tour rate is $35 per person, $15 per child 12 and under. This Tour includes entrance into the Bermuda Underwater Exploration Institute(BUEI). Good morning from Canada, Thank you for your reply and I think you will find this very interesting. I just received an email back from the site "Oleander Cycles", and I was told they do not do private tours anymore and that you have to book directly from the cruise ship. They told me they do have a trolley in the Naval Dockyard but do not know price as the cruise ship dictates prices ?? ?